Community Board 8 has a brand new district manager, Patricia Manning. Yet she’s a 30-year veteran of the office. (I remember working with her briefly in the early 1990s, when I was working for the borough president and the Department of Sanitation in Community Boards 11 and 8 on education and helping communities adhere to the brand new recycling law. I also remember her daughter worked (works?) at the Botanical Garden in the Bronx. More news on her new gig in The Riverdale Press. Happy post-Father’s Day to all Bronx dads. (OK, not just Bronx dads.) If you did anything in the Bronx for Father’s Day and have a good pic, please share (bronxmatters@gmail.com), and I’ll try to post some. 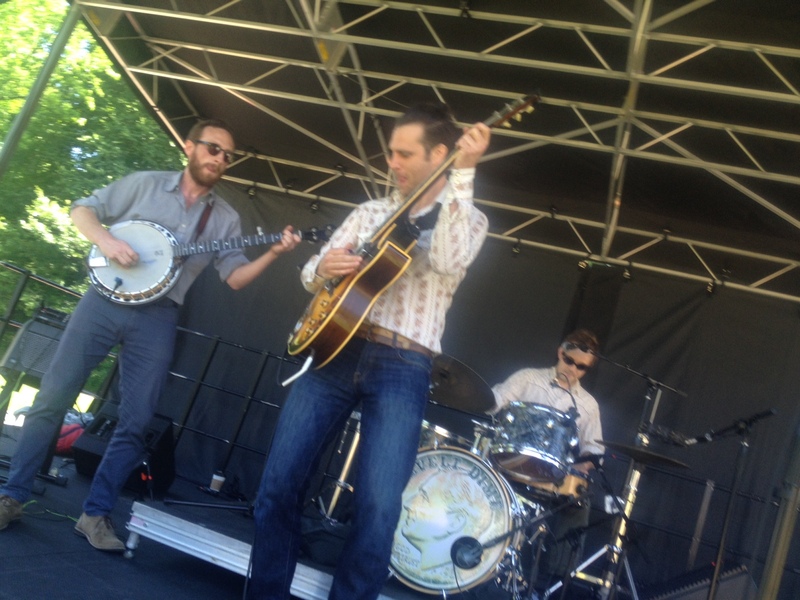 My wife and daughter took me to the NY Botanical Garden for it’s Big Backyard BBQ and Music Festival (photo of great band, Roosevelt Dime, above). As stated in my last post, debate on Democratic Congressional race in District 13 is on TV tonight at 9 p.m. Charlie Rangel didn’t show up for it. 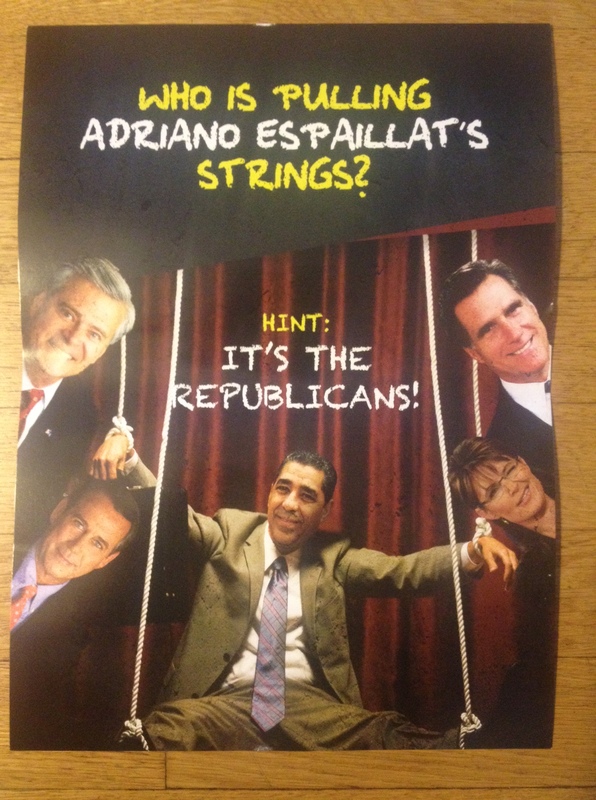 Speaking of which, here’s two pics of Rangel’s most recent campaign mailing. 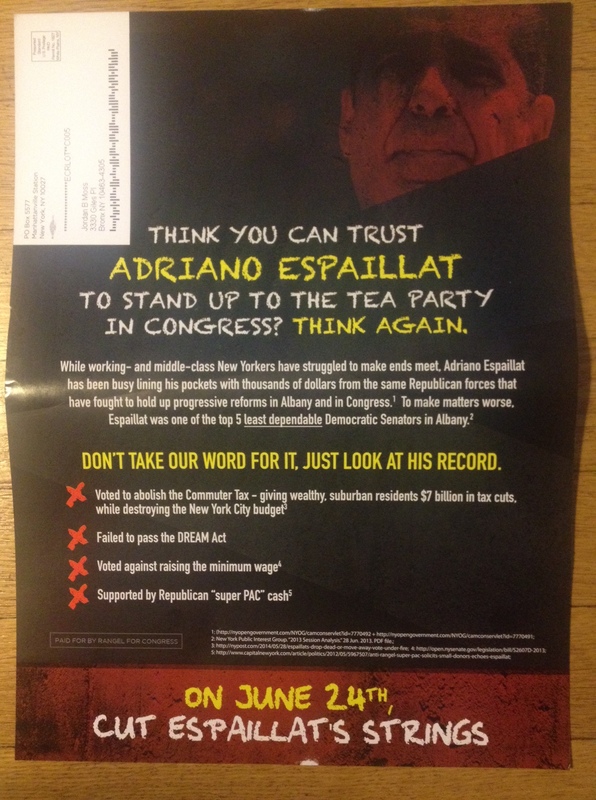 On the second page, it has four attacks on Espaillat’s record, one with a footnote no. 4, but there is no actual footnote for “4” listed below. And accusing him for failing to pass the DREAM Act, something Espaillat supports, ignores arguments that the Independent Democratic Conference (led by state Senator Jeffrey Klein) put it to a quick vote before it could secure sufficient Republican support to pass it. Espaillat did, however, take part (as did Klein) in the highly unpopular repeal of a tax for commuters to NYC and told the Daily News that he regrets it .